Thinking about health is stressful. For that matter thinking about death is even more stressful. We either obsess about it or we don't want to think about it at all. And doing the right things to be healthy and have longer lives seems to be a signal that's been lost in the noise. A big part of my job is to take the burden of worrying about health research from my clients so they can focus on other more important things in their lives, like being happy and purposeful. So when I find a resource that's up to my high standards, it's my job to let my clients and readership know. Someone whom I've been quoting and using as a resource for quite a while is Chris Kresser. When he finally came out with a book: Your Personal Paleo Code, I had to get my hands on it immediately. It's kind of too late to rename the idea, so for better or worse we're stuck with the term Paleo. There's nothing wrong with the term, it just makes people focus on the diet and not the concept. Sometimes arguments over it are really over semantics. The concept is this; if evolution is the central unifying doctrine of biology, and health, diet, wellness all fall under biology, why aren't we asking about how we were evolved to eat? The Paleo Diet is all about posing this question. It seems like a no-brainer now, but this wasn't really being asked prior among the mainstream diet experts. Let's not worry about it, while the country got sicker and fatter. Call it what you will, but everyone can benefit from posing the question of evolution in regards to diet. The early pioneers of modern Paleo were also the people with the least confirmation bias. They weren't trying to prove anything. There was something wrong with the American diet and they wanted to see the data for themselves. To question where the "experts" really got their facts from. Are all the interpretations of modern Paleo correct? Maybe not. But what's more important was this attempt to use evolution as the framework to judge any health theories. That's the heart of biology. It's become difficult to near impossible to adhere to the strictest guidelines of Paleo. And if you get too strict and dogmatic, then it defeats the purpose. That this diet was supposed to be based on science not on dogmas and food politics. It gave us the rules, and once you know the rules, we can begin to modify the rules to our own unique individual bodies and lifestyles. If we are to be scientific, then regions where people came from matters. Technology can aid us with services like InsideTracker that allows users to test blood biomarkers. Different people can tolerate different things, that needs to be taken into account. Chris Kresser gets it. That's what Your Personal Paleo Code is all about. Chris writes in a conversational style and begins with his own health journey. It's easy to follow for anyone, you don't need a lab coat to get it. Everything he writes about makes sense and you wonder why no one else broke it down like this prior. He doesn't get dogmatic or religious with the Paleo beliefs. He gives you the framework, why things work this way, evidence from studies and from his own health practice. • Reset - For 30 days or more you stick to a moderately adherent Paleo diet and he teaches you all the ins and outs to detoxify your body. Based on your personal health and background, he gives you guidelines to modify the reset period. This is how you build your own Paleo Code, meaning the diet and lifestyle that's right for you. There's also questionnaires to understand what would apply to you best. It's pretty paint by numbers, hard to get lost. His section about inflammation and having a healthy gut are two of the more powerful premises many readers may not be familiar with. • Rebuild - After you reset you begin to reintroduce foods again every few days. Then you see what your reactions are. Immediate, delayed, or none. If you have no reaction to it, chances are you're pretty tolerant to it and it can be added back into your diet. There's only a few things Chris points out that you should attempt to avoid completely but he also understands the psychology of completely eliminating a food group you enjoy from your life. Based on your reactions, there's foods you can eat pretty regularly, occasionally, and rare to never. • Revive - This is where you fine tune and optimize the Paleo Code for your particular lifestyle and health. He also gives examples based on situations and also more questionnaires regarding your lifestyle. There's meal guidance and where to look on his website for more resources. When you follow the guidelines; just like how I explained it the whole concept of Paleo, you should have a framework for the rules and original intent along with modifications that are specific to you. Learn the rules before you modify or break the rules like eating some grains. Chris has come up with a long term solution. 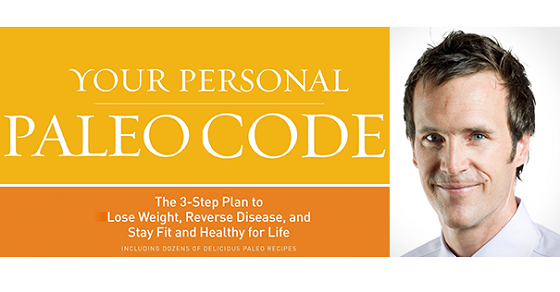 I must say out of all the diet and health books I've read, Your Personal Paleo Code is my personal favorite. It's unique in that it understands people are not beings of pure logic with unlimited will-power. There has to be some give and compromise, and with Chris Kresser's clinical background, he's been able to do it.